October is National Chili Month, and what a perfect time of year for a pot of chili. The weather is starting to turn, it’s football season, and chili is the perfect way to stay warm and enjoy the game. In commercial operations, chili is often prepared ahead of time and then warmed up and held at serving temperature. This process uses a rethermalizer. There are three methods by which rethermalizers do their job. Deciding on the right rethermalizer should start with understanding these methods. The first and most common method is the wet method. In units that implement this method, a well or water bath typically holds around five cups of water, depending on total capacity. When the unit is plugged in and turned on, it heats the water. The food pot is placed in the hot water bath. This is the classic soup rethermalizer. The upside is that it heats up food to safe temperatures in a reasonable amount of time without scorching. The downside is that the water needs to be replaced regularly. These units can also require some extra cleaning, especially if the water isn’t replenished frequently enough. The second type of soup or chili rethermalizer utilizes the direct-heat method. These units feature heating coils that wrap around the unit and transfer heat directly to the cold food pot. Much more efficient than the wet method, these units may require additional attention to make sure that food is stirred and doesn’t scorch. The final rethermalizer technology features induction heating. 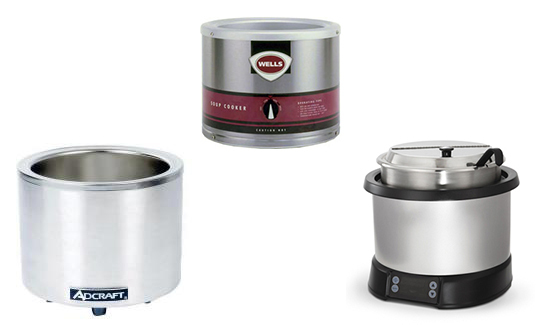 In induction rethermalizers, an induction heat source at the bottom-center of the well heats up the induction-ready food pot and the heat is then transferred directly to the food. This is the most efficient type of rethermalizer, however they are not compatible with just any food pots. They require specific, induction-ready pots. No matter the method, soup rethermalizers are a great way to warm up previously cooked chili and serve it nice and warm on any football Sunday during National Chili Month.